The only time I get to have new shoes is when school starts. I came from a middle class family and the only time we get new stuff is just before school. My folks would buy me a pair of leather shoes and a pair of rubber shoes for PE. The idea of buying shoes out if vanity is totally alien to my folks. Not even Christmas. We get our new shoes in May and it’s got to last to next year. So much for my plans of turning to assassination as an alternative career. If James Bond used bostons, his license to kill will be revoked by M.
All our shoes then were made in Marikina. ( Can you still buy shoes in Marikina other than in SM Marikina? Sorry Off-topic.) If the shade wasn’t right we did the “jovos” thing. Jovos is leather dye that you apply to your shoes using an old toothbrush. It comes in many shades are is usually available in your local sari-sari stores. It is also very noxious so don’t touch the stuff---and don’t use the toothbrush for your teeth. How noxious is jovos? Let's just say that if it can stain the hide of a dead cow, immagine what it can do to your skin. Rumor has it that it will also kill rats. I haven’t killed any yet. 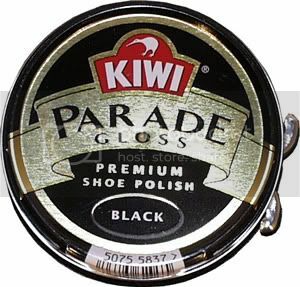 When we polish our shoes, we had the old Broadway shoe polish aka “Biton”. No imported Kiwi wax yet. Broadway comes in small tins that you open using a small coin. It also has the tendency to cake and dry when left in the open. You apply Biton using an old t-shirt or better—an old underwear whose garter has turned bacon (the joys of recyling). Biton comes in all shades and even comes in white (for polishing that D.O.M –mish white shoes used by D.O.M.s, biyudos, members of the Knights of Columbus and old court prosecutors). To make your shoes shinny, you apply a nice coat of biton, and then you use a shoe brush. Then comes the nice part, you spit on your shoes. Yep you read that right, YOU SPIT ON YOUR SHOES (saliva only please...). Then you buff your spit into the wax using a soft cloth. Now you know the origin of the phrase “spit polish”. Spit polishing is one of the pure joys of a manly man. Apart from a convention of taxi drivers, it is the only time when it is socially acceptable to spit in public. I even remember this shoe shine guy who works the floor near the courthouse in Manila. He produces this flawless shine that is water repellant. Instead of Biton, he uses lard. Lard as in cooking-Cisco-lard. Imagine the surprise on my face when he started applying Cisco to my leather shoes. Then he applied the second part of this trade secret: non-stop spitting on my shoes (health certificate, manong?) I think he used a cup of his own saliva on my pair alone. I do spit polish my shoes, but my technique doen’t require a WHO health advisory, but this guy was really abusing his salivary glands. Fast forward to Kiwi and the insta-shine foam. Too bad for this generation. Sir, where is thee word 'Biton" origin,why thwy called it Biton" ? I had my business shoes fitted with metal "biton" once... It sounded like I was tap dancing whenever I walk in our office lobby and ruined the carpet in my cubicle.